As some of you may know that I came in Italy. Right now I am in Turin and last night was one of the first programs which were scheduled, the rests are in coming week. Last night’s program was organized by the mayor of Almese “Bruno” and Valeria, Ignazio, Silvia and Meri who doesn’t like her name appear here. I appreciate them deeply for the efforts they did. Lots of questions rose, among the questions a teenage girl asked me: “Why Taliban don’t allow children to go to school”. This is question that even Afghans couldn’t find the answer; it’s like unanswerable question for us because we can’t find the reason why Taliban burn the schools, killing the teachers, burning the books, very recently men squirted the acid from water bottles onto three groups of students and teachers walking to school in Kandahar. The only thing I remember to answer to this teenage girl “Francesca” was they don’t like the children go to school to study science but religious school to train the new generation of Taliban. It was a wonderful night with lovely people. 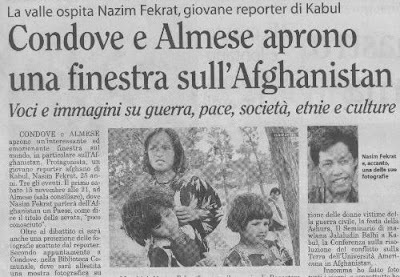 During few days of my stay, I realized there are many things in common between Italian and Afghan. The people here are so friendly and welcome the guests and visitors; the people here showed me great hospitality.